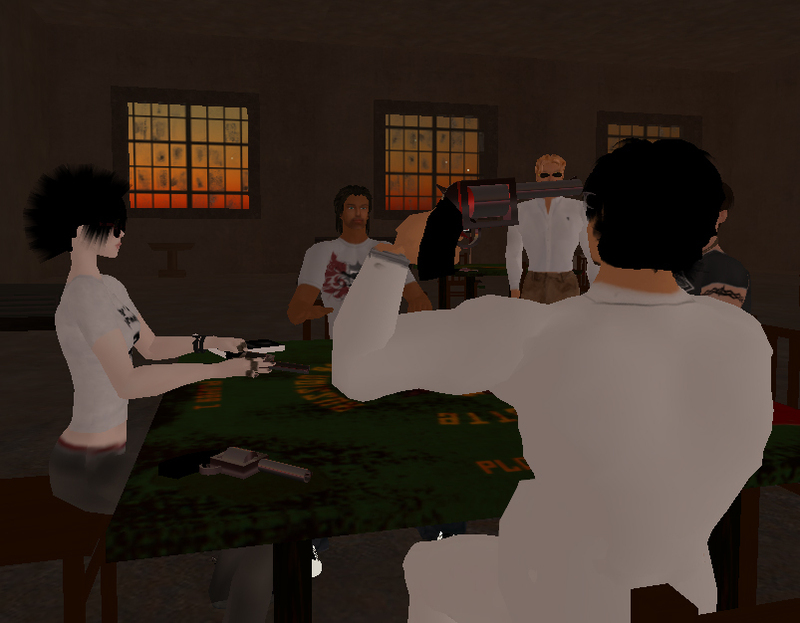 If you're looking for a friendly game of Russian roulette (and who isn't, nowadays), you can take a trip to the abandoned warehouse on the corner or Peralta and Alva in Zephyr Heights, an urban island with a day cycle that's been set to permanent dusk. 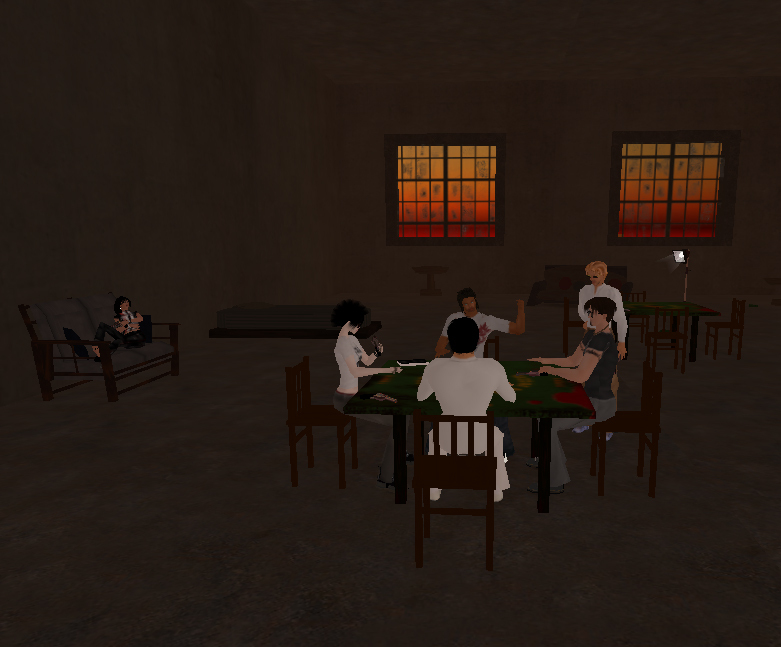 The game tables are on the second floor, framed by a set of smudged windows that nicely display the blood red sunset outside. 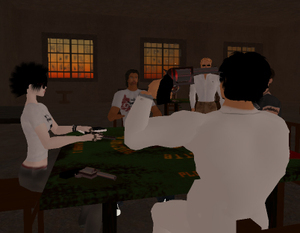 I first heard about the growing mania for Russian roulette from Bub Linden. Bub said he knew folks who played the game with sweaty palms, it was that intense. But I was doubtful, because after all, Bub's a zombie with a penchant for farting on the avatars of estemeed writers. 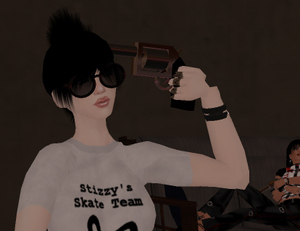 But beyond that, how could putting a virtual revolver to your avatar's head possibly cause so much stress? So after arranging a match with Tripper Tapioca, the skatepunk entrepeneur who owns Zephyr Heights, I made my way from the bus stop to the warehouse and up some rusty stairs, where a crowd was already waiting. 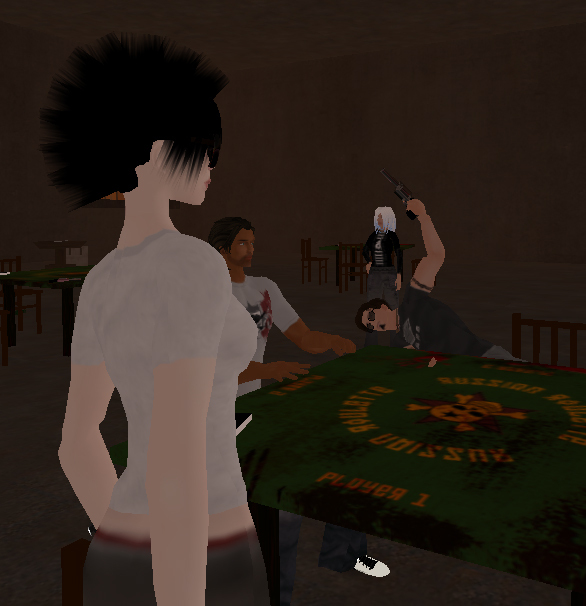 Including Robbie Dingo, creator of the game, who pointed me to the pistol on the table-- the one I'd be using when it came my turn. 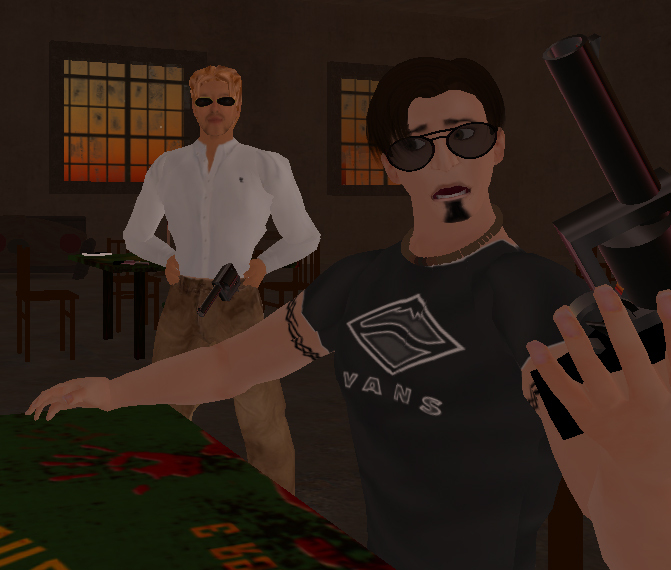 The game mechanic for Dingo's Russian roulette is elegant and rather simple: you sit down at the game table, you get your gun, you ante up, and the table's internal scripting handles the rest. 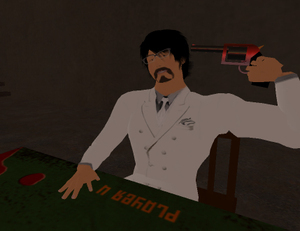 When it's your turn, an animation takes over, causing you to spin the revolver, put the barrel to your temple, and pull the trigger. If the chamber comes up empty, you shake your head with relief, and it's the next player's turn: they can call the ante, flee the game-- or bid up the pot. "Let's raise the stakes a little," Robbie Dingo announces, just before it's his turn. After one round, it's already over L$1000. "I have a feeling that this is going to be a wallet-emptier," Barry Rawley says, next to him. Dingo shrugs. "You called the thunder..."
"OK, this is nerve racking already!" Rawley shouts back. 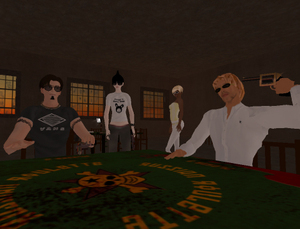 Dingo spins, fires an empty chamber, and it's Tripper Tapioca's turn. When it's his turn again, Barry Rawley isn't as lucky. A loud, sudden pop, and he's slapped to the ground. The death animation is quick, startling, and over fast. 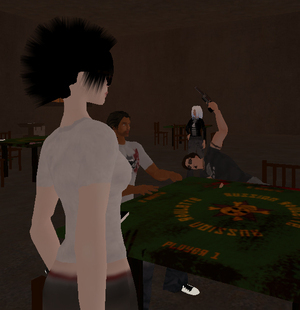 A player who shoots himself is kicked from the table, to stand aside while the survivors keep playing, until one is left to claim the pot. 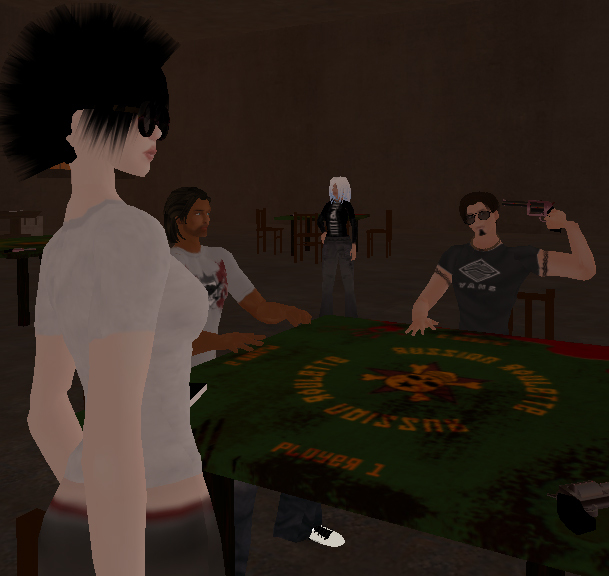 When it's my turn to spin and fire, I'm surprised at how tense I get, watching my avatar move without my control, as he goes through the motions of attempted suicide-- like standing outside your body, and nightmare-like, being unable to stop yourself. There's a rising tension when you hear the greased clicking of the spinning revolver; for a split second after the trigger's pulled, it's excruciating. When the hammer does come down on a live shell, it's even worse. The bang and instant of impact are jolting. But then, ironically, it's a relief to get shot and go flying, because the suspense ebbs immediately, and you laugh at yourself for getting so wound up in the first place. 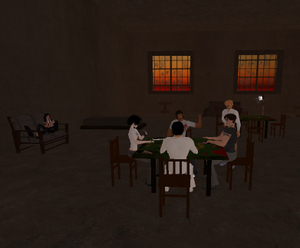 We play a few rounds, then sit around drinking some beers, discussing what we just did. I ask them what it was like to have a gun to their avatar's head. "Nerve-racking," says Barry, "because there is a one in six chance you will blow your brains out." "It seems more morbid somehow," I observe. Tripper Tapioca smirks, unconvinced. "Well, killing generally is morbid." "[I]n most first-person shooters you're killing Nazis or evil aliens or better yet, evil alien Nazis, so at least there's some kind of moral framework (or rationale, at least)," I argue. But her point is a good one, so I have to sit there awhile to try and better articulate my intuition. "I guess the difference, Trip, is that suicide is a way more likely scenario for young people, than running around shooting people, so fantasizing about it (which we can do with this game) seems to be playing with real possibilities..."
Robbie Dingo intercedes. 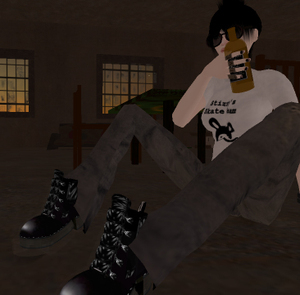 "The question is, do you cats relate Second Life and real life? Do you feel this game could encourage someone to experiment with guns in RL?" "No," says Tripper, "because that's like blaming Grand Theft Auto for [causing real life] violence... Technically," she adds, "FPS games are suicidal-- you run out onto fields with people shooting at you." Robbie Dingo sips his beer. "I was asked by someone to add gore to the end animation," he muses. "I declined. Didn't wanna add that level of realism. It's a cartoon. Like a cap gun, perhaps. Violence but not blood." "As a kid," I recall, "We used to play Russian roulette with a cap gun and even that was kinda freaky... we were afraid we'd bust our eardrums so we pointed the gun away when we did it." "Probably a good idea, that could do some real damage." "... Also, we were allergic to smoke and afraid we might get asthma, so we put the gun in the other room and tied a string to the trigger. But first put the gun under several couch cushions and hid behind a table. AND EVEN THAT WAS FREAKY!" Robbie Dingo guffaws. "I should shoot you myself for that." Whatever the attraction, Robbie Dingo's sold several dozen copies in the couple months it's been on the market-- a game inspired (of course) by The Deer Hunter, and a desire to provide an alternative to all the traditional gambling games already so popular in SL. "The deal is it's a fun game where the money in play is used as winnings, i.e., it's a non-profit game," he says. "I was fed up of all those card tables making profits for the owners, so that's where it differs." As for his own view on whether his game is exploitative, "I respect that one could pull in lots of different angles on this," he allows. "Taken to the Nth degree, one could argue that the content in SL encourages infidelity, gambling, drug-use, delusion of grandeur, sexual deviance, violence, anorexia, free-speech, and furries also. Inevitably," he concludes, "the debate will end on personal views and opinions of mass-censorship in adult entertainment." Or as he puts it in mantra form, "It's only a gameshow, its only a gameshow..."
"Robbie Dingo sips his beer." 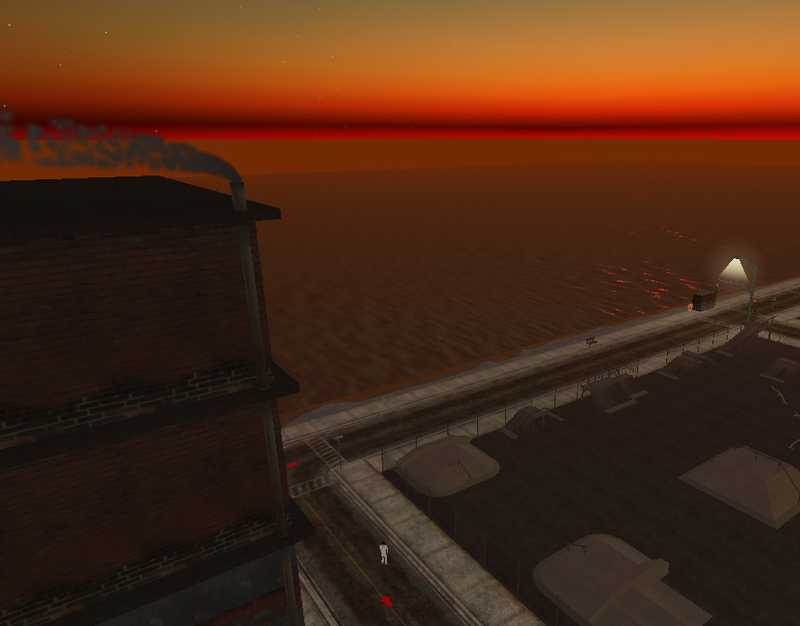 ""The question is, do you cats relate Second Life and real life? " I think you are starting to confuse animated pixels a little too much with Rl. I played a tension fraught game with Siobhan O'Flynn and moo Money one night on the top of the (now gone) Dazzle Castle in Innamoramento. I ended up winning our (very low stakes) pot but everytime it was my turn I was also sort of queasy, hoping that I wouldn't hear a bang! It's fun, but definitely kind of intense. Thanks for the typo catch, Alex! I believe that I played this while it was in beta, and it is terrific - most certainly one of those "I wish I'd thought of that first" moments. i would like to know if a script will be made to play russian roulette, so it won't be considered gambling.